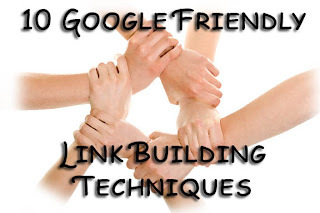 10 LINK BUILDING TECHNIQUES Google Penguin wont Mind! Link building has now suddenly came into focus once again, as Google is repeatedly trying to stamp out black-hat SEO practices. So the trend now is on building legitimate backlinks rather than buying them off a cheap package. Even so, Google Penguin is still pretty touchy, and you need to build links with care. We earlier shared some great ways to earn trusted backlinks, and ways to score relationship-based links. We'll continue on with that thread, and share some more tips, this time on building links the Penguin-friendly way! DMOZ is an online directory that has a very high PR. Getting a link from such a website can be invaluable. You can get your blog listed in the relevant categories. So if you want to build a link, start by getting listed on DMOZ. But keep one thing in mind. While considering a category to get listed in, always try to select the most relevant one, yet one that has the least number of out-bound links (indicated by the number in brackets next to each category). This is because even though each page on DMOZ might have the same PR, but not the same value. The more the links, the lesser the value. So your aim should be the least number of links for the most value. Now, this is a fairly common technique, so we're not going to squander much words on it. I would however, like to show you a couple tools that can help you with commenting on other blogs. We discussed about DropMyLink in an earlier post. You can use it to find relevant blogs you want to comment on. There's another handy tool called Scrapebox, which will help make blog commenting much easier and faster. Do give it a try, and see how it can speed up your work! The advantage of Disqus over other commenting systems is, it is really easy to use, and comments that you make appear instantly. Furthermore, you can post them on Facebook as well, so that your friends can see what you've been upto - hence giving you more referral traffic. So to find such sites with the Disqus commenting system, you first have to create an account. Your username will be the anchor text for your links, so you might want to create more than one account for each category you want to comment for. Now, you can just search Google for keywords, combined with the phrase "powered by disqus" (with quotes). You will land upon some blogs using disqus. Open a few you like, and check if they have a high PR (we recommend you install the SEOQuake toolbar). Find a high quality blog, and start commenting on it. Additionally, narrow down your search to the last two weeks or so using Google's advanced search. Commenting on pages that have no comments is recommended, because that'll give you some referral traffic as well. There are certain sites that use Twitter data for real-time search, ascertaining social authority, Twitter lists, and so on. These sites use links found in your profile, especially in your bio, and use those links in their listings. So if you have your website links in your profile bio, and a Twitter handle as well, you'll be automatically building links! Some such sites are listed below. You can add yourself to them, and build some more links! Ever seen a mysterious link along with some text appear as you copied some text from a website? It is called 'attribution text', and you can do it for your website too. You'll be getting links as people copy and paste your content around the internet. Read the following guide to learn how to add attribution text. Often times, people will talk about you, or mention your brand without actually linking to you. In such cases, you probably want them to link to you properly. To find out whenever this happens, you can set up Google Alerts. Set the 'Result type' to Everything, and 'How Often' to As it Happens. This way, whenever Google comes up with something new that fits into the search query, it will alert you. So if someone mentions me on their website, I'll get to know about it via email as soon as Google finds that content. I can then contact them, and ask for a link (refer to our post on relationship-based backlinking for details on how to do this). This tip is a lot like the previous one, but in this case, you want to look for an actual mention of your url instead of your name or keyword. For example, someone might have mentioned mybloggertricks.com without actually linking to it. In that case, you don't need a Google Alert, since you want to find mentions that've already happened (you could set up alerts too if you like, as in the previous tip). Simply search Google for something like "intext:mybloggertricks.com -site:mybloggertricks.com", and you'll get a list of all the sites that match the search. Now, you can export the search results using a bookmarklet such as SERPs redux. Export the list into text file, and then use the Screaming Frog tool to crawl those links. You will want to add filters, such as Does not contain link (that you mention, i.e. mybloggertricks.com). Now you already had a list of all the links that contained your website's URL in the text. Now some might have that as anchor text, which is what you wanted all along. So you needn't check such sites. But once you crawl the links using Screaming frog, you'll get a list of webpages that don't have your link in them, even though they have the text. Here's the basic concept. In this technique, you basically help other websites (that are sending a lot of traffic to you) get a better rank in SERPs, so that in-turn, your own traffic increases. Now this might take a lot more time, but could be worth it if the traffic coming has a high conversion rate. For example, let's suppose we have a page where people purchase an eBook. Now, I can see from my analytics data, that a Blog 'X' is sending the most numbers of users, who are buying this eBook. Now if that blog 'X' doesn't rank #1 in SERPs for the specific keyword, I probably want it to rank #1, so that more people would visit blog 'X', and hence more people would come to our site to buy the eBook. See? The basic concept behind this technique is that, if it is too hard to get a related backlink from your niche influencer, or if it will take a lot of time, then you probably would want to get a backlink from the sites that your niche influencer links to. To find such sites, you'll have to have the Screaming Frog tool we've talked about, and the SERP redux bookmarklet. First, enter the URL(s) of your niche influencer(s) in a text file in list format, and then import the file into Screaming Frog. Now, you'll have to crawl those URLs, but first, let's do a few settings. Make sure you check the 'Check External Links' option, along with the 'Follow External nofollow' and 'Ignore robots.txt' options. Also set the Search Depth Limit to 1. There, you'll get a list of all the websites your niche influencer links to. You'll benefit a lot from getting backlinks from those websites as well. Yes , i'm long time subscriber ... been a regular visitor since 2008 . Something to inspire from their acheivement .. smartearningmethods.com , then now, richincomeways , whats NEXT ..
good one but can you elaborate how to get listed in dmoz because i tried and could not get required results actually i got confused how to do that.along with your attribution link tutorial is awesome it will help a lot to my blog http://bestofshayari.blogspot.com. getting Back Links Is So Important ? s getting backlink increases everything to your blog.. that's what alexa also minds... so it's important to get a backlink.. Very helpful post in establishing multi linkages, for every blogger wants to succeed in their job. thanks! Mr Qasim... as you discussed, the very first technique DMOZ listing is not that easy man. BTW good post and good to read about Disqus comment system as it is really powerful commenting tool. I hope, this FREE Metro style blogger Template will be useful for some bloggers. Thanks for providing new information.I don't about disqus and its usage.Now i implement disqus method to get backlinks.Thank you. are ios 7 copy android feature??? Nice Article Qasim !! I want to add a small tip concerning link building, Avoid guest posts. Have a conversation with webmasters and know what kind of articles that's related to your business that they want to put on their website. This is much better than sending a random guest post that has no value and will get the webmaster to delete your email request instantly. Thanks for sharing. Link building is the major part of SEO and above post giving very useful tips regarding link building. The goal of Link Building Search Engine Optimization and Link Building Agencies India is to obtain and maintain a number of high-value and Best Seo Link Building and offer Links Building Services. This is very essential blog; it helped me a lot whatever you have provided. open multiple link This blog site has really a huge collection of articles with impressive information. My question, is disqus comments are dofollow? will SE index those ?